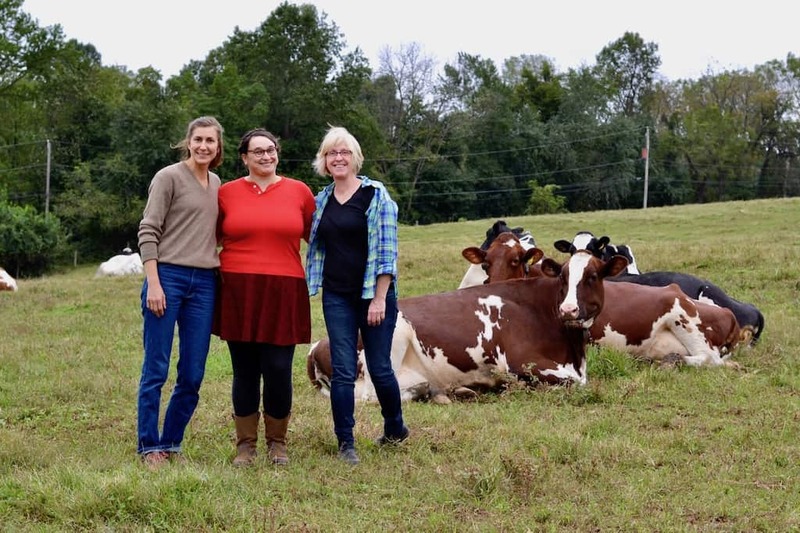 As a female-powered cheese collective, these three women run a regional CSA that focuses not only on education but also on sharing small-batch cheeses with an indelible sense of place. “Dairy is feminine in so many ways,” muses Jones, operations manager for the Collective and a regular host of cheese classes in Philly. “Cows are female, and dairying was traditionally the province of the farm wife—she milked cows and made cheeses to supplement the family’s diet.” American dairy businesses came to be male-dominated following the shift to factory production in the 1800’s. Centuries later, Collective Creamery honors and reclaims the female roots of the industry. In doing so, the Collective tells a larger story—heralding cheese as an agricultural product. This, Miller says, is critical with the dairy industry in crisis and family farms shuttering. She would know. Following the milk price collapse in the early aughts, her pivot to cheesemaking in 2006 saved her farm. Her first foray into cheesemaking was a tenacious one: a natural-rind Birchrun Blue. Now, it is a PA classic. Angstadt agrees, citing Miller—aka “the godmother of Pennsylvania cheese”—as a mentor. A 2015 Zagat 30 under 30 honoree, Angstadt is also making her mark. Called back to her ancestral land in the Oley Valley after a stint in Manhattan finance, she launched Valley Milkhouse in 2014. Where Miller is bold and animated, Angstadt has the countenance of an artist, crafting soft-ripened and fresh cheeses like her aptly named Witchgrass. A cow’s milk homage to Valencay, its blue-gray rind is tinged with charcoal ash. Her muse in cheesemaking? The washed-rind cheeses she recalls from childhood trips to Belgium, her mother’s homeland. Shared passion for celebrating pasture-based milk also inspires synergies. This fall, Angstadt launched a gouda made with milk from Miller’s farm, with a clothbound cheddar in the works. Miller, in partnering with Angstadt, is discovering new love for her “quiet” cheeses like Equinox, a Swiss-style cheese with an underpinning of toasted caramel. “That support factor has been really instrumental,” she says.